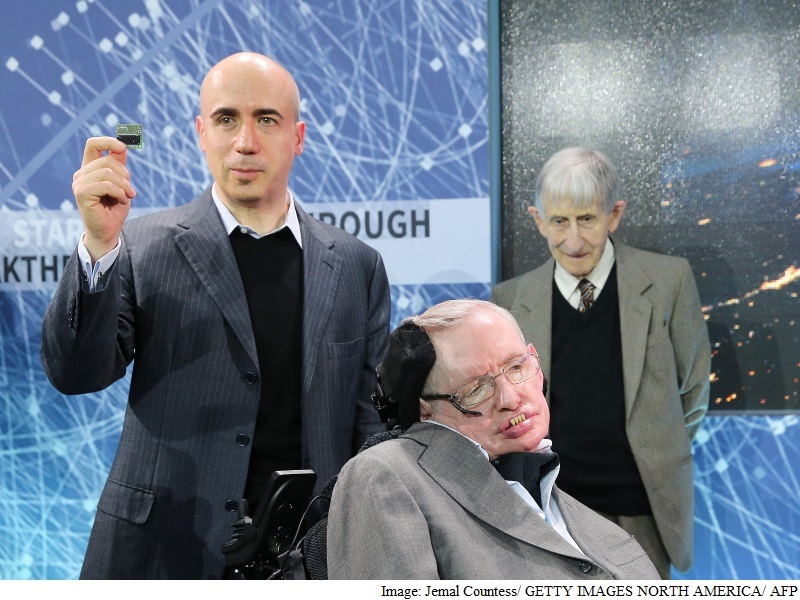 World-renowned British astrophysicist Stephen Hawking on Tuesday teamed up with Russian billionaire Yuri Milner and Facebook founder Mark Zuckerberg in a $100 million (roughly Rs. 663 crores) effort to make tiny spaceships capable of interstellar space travel. The project, dubbed “Breakthrough Starshot,” is a research and engineering programme that aims to build laser beam propelled “nanocrafts” that can travel at 20 percent of lightspeed – more than 1,000 times faster than current fastest spacecraft. According to Milner, once the “nanocrafts” are built, they could reach Alpha Centauri, a star 4.37 light-years away, approximately 20 years in a fly-by mission. The “nanocrafts” are gram-scale robotic spacecrafts consisting of two main parts: a computer CPU sized “StarChip” and a “Lightsail” made with metamaterials no more than a few hundred atoms thick. Although weighing just a few grams, the “StarChip” is a fully functional space probe, which carries various equipment including cameras, navigation and communication. “The ‘StarChip’ can be mass-produced at the cost of an iPhone,” Milner said. The “nanocrafts” can then be propelled into space by a powerful laser beam, which according to Avi Loeb, a theoretical physicist and panellist at the news conference, will carry a power of 100 gigawatt. “This is the power needed to lift off a space shuttle,” Loeb said. “Fifteen years ago, it would not have made sense to make this investment. Now we have looked at the numbers, and it does,” Milner said. The project was part of the Breakthrough Initiatives first launched in July 2015 by Hawking and Milner, including a series of research plans to scan the 100 galaxies closest to the Milky Way in search for aliens. “Starshot” is its newest endeavour. While one cannot hear the joking tone through Hawking’s voice synthesizer, his humour had been easily received. “A lot of science will be learned by the process of going through this, making this happen,” said panelist Mae Jemison, a former Nasa astronaut. “Today we commit to this next great leap into the cosmos because we are human and our nature is to fly,” Hawking said.